Our guides are designed to help you be more effective in your campaign, co-op or project. The ideas, examples and tips in our guides are based on working with many different groups and projects, both as campaigners and as trainers. We've also linked to other resources you might find useful. All Seeds for Change guides are anti-copyright. Feel free to copy, adapt, use and distribute them, as long as the final work remains anti-copyright. If you translate any of our work please let us know so that we can link to your translation. Please feel free to get in touch with any feedback on our resources, including how you are using them. Publicity and outreach are essential for communicating campaign messages and getting people involved in taking action. In this guide you will find plenty of tips on how to best get your message across. Using the media can help you win your campain. This guide covers the basics you need to know about getting your campaign message across in newspaper, radio and on tv. A guide to getting money for your campaign. Projects and campaigns usually start because we feel inspired - our first impulse is to throw ourselves into action straight away. But if we take a little time to analyse the situation and to develop a plan of action we can increase our effectiveness and our chances of success. At some point in time in the life of any campaign you'll find yourself talking to others face to face about the issue - here's some pointers to help you get your message across. Ideas, tools and skills for organising and taking action in a non-hierarchical and autonomous way - using affinity groups, buddies, quick consensus and spokescouncils. A guide to the steps you can take to make your action a successful one. Whatever kind of action you're planning to take, preparation is key to success. Thinking about what to expect, what to take and what roles people can play is all too often neglected. Worried about viruses, Big Brother and computer security in general? This is a simple, practical guide to computer security. Simply print it out, fold it to show your chosen level of security and keep it next to your computer. Direct Action Handbook - Lots of ideas and info on taking direct action. Delia Smith's Basic Guide to Blockading - lots of useful info, please note the legal info is out of date. Consensus is a decision-making process that works creatively to include all persons making the decision. This guide includes sections on quick decision making, consensus in large groups and consensus troubleshooting. A 228 page handbook explaining the spirit and philosophy of co-operative decision making, as well as providing practical guidance on how to facilitate a consensus process. Includes edited and expanded versions of materials available on this page, plus new material on how to address conflict and power imbalances in your consensus based group, facilitating virtual meetings and thoughts on how consensus might work on a community, regional or even national level. Watch our series of three short videos explaining what consensus decision making is, how to do it and some tips on making it work well. Total viewing time for all three videos: 5min 23s. A guide to using consensus in fast moving situations, including actions and protests. The spokescouncil is a technique that enables consensus decisions with hundreds and thousands of people, with the maximum number of opinions and ideas being heard in an efficient way. It is used by many groups such as social centres, workers' co-ops, peace and environmental movements. The mice tell us about consensus in this short introduction. An A4 poster illustrating the consensus process and what we need to do to make consensus work well in our group - draft. A flowchart of how consensus can be reached - this complements our guides on facilitation and consensus. Workshop plan (agenda) for you to use or adapt for your own workshop. Facilitation is about making meetings as easy and effective as possible. This guide offers tips, techniques and concepts to help you create positive and successful meetings. If you are facilitating for the first time, or you've been doing it for a while and want a chance to reflect - this guide is for you. A compilation of tools and techniques we find useful when working in groups and facilitating meetings or workshops. Some of the most commonly used hand signals used to make meetings run more smoothly, and help the facilitator spot emerging agreements. The minutes of a meeting are a record of important points that will be useful for the groups to remember. This guide offers tips to help you create informative, accessible minutes that are quick and easy to write. Group agreements are a useful tool for getting your event off to the right start and keeping it on track. They help a group to come to an agreement on how it will work together respectfully and effectively. Good meetings are vital to working together as a group, whether this is a campaign group, a self-development or support group. They can make all the difference between a group feeling motivated and dynamic or a group getting stuck. A facilitator's guide to how to adjust your meetings for people with physical and sensory impairments. Our guide on practical access issues may also be useful. A big part of organising events is looking for a good venue that is accessible to anyone who might want to come. This guide offers tip and check lists to help you choose and prepare venues to meet everyone’s access requirements. (For a facilitator's guide to access issues see Making Meetings Accessible). Active listening is a useful skill for all sorts of situations - whether you're taking part in meetings and workshops or dealing with conflict. By actively listening we can come to understand how the speaker feels about a subject or situation - this briefing explains how we can hear people through their words and tune into their underlying emotions, concerns and tensions. Meetings can be quite challenging – and if you’re not all in the same place they can be harder still. A guide with tips and advice on facilitating meetings over the phone, net and by morse code. A guide to successful group organising, from starting up groups to keeping them going. With lots of tips, examples and questions to help you create a group that is inclusive and effective. Feedback is an essential tool to help us learn new skills and improve existing ones. Like most things, giving inexpert feedback can hinder rather than help. This is a short guide to making the most of your feedback sessions. Ever wondered how to introduce a new way of doing things to your group? A step by step guide to how you can make changes in your group. Working with Conflict in our Groups: a guide for grassroots activists. This 40 page booklet, written by our sister co-op Navigate (previously called Seeds for Change Oxford) and published by EYFA is aimed at people and groups working for social change who want to develop an understanding of conflict and how to deal with it. There are sections on what conflict is, the benefits of addressing it, and tools to work though conflict and maintain healthy and effective social change groups. A short checklist for groups who want to attract more people. A quick look at what co-operatives are and what they do. 5 steps to setting up your workers' co-op - a quick checklist. Workers' co-ops give us a way to reclaim a small but significant part of the world - our working lives. In this book you'll find lots of information you need to set up your workers' co-op, including organising your workplace, making decisions, choosing the right legal form, business planning along with info on tax, insurance and other such details. 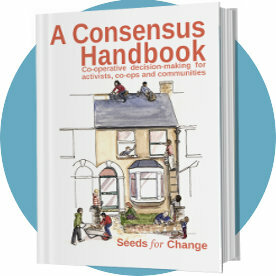 This is a guide Seeds for Change co-authored with Radical Routes (Hard copies available for £7 from them). We think it’s important that more than one or two people in any co-op understand what's going on with the finances if we want to be truly democratic in our decision-making and develop successful alternative business models. So we wrote this guide aimed at anyone who is involved in co-ops: the aim is to demystify the world of finance to enable all co-op members to fully participate in financial decision-making. 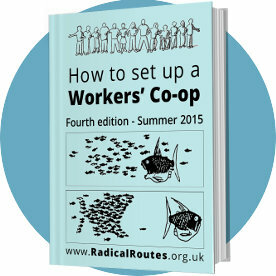 An overview of what you need to do to get your Worker's Co-op off the ground (A4 Poster). These articles (constitution) are for a workers’ co‑operative registering as a company limited by guarantee. They are for a workers’ co‑operative which is fully mutual, using either consensus decision making or voting and in common ownership. Includes explanatory notes and sample secondary rules. These articles are on the ‘Approved Model List’ of both the Co‑operative Enterprise Hub and Co‑operatives UK. This means that both bodies may will register your co‑op with these articles (or you can register yourself by following the instructions in the How To Set Up a Workers' Co-op handbook). These articles are also suitable for use by co-operative consortia (service Co-ops) - instructions on how to adapt them are included. This is a sample constitution for groups to adapt and use - you may need a constitution if your group wants to open a bank account or apply for funding. ○ ODT - 33k Libreoffice | DOC - 120k Microsoft Word. A brief comparison of legal forms available to common types of co-op. Introduction to Radical Routes booklet introducing Radical Routes. Topics covered include Aims and princiles; How Radical Routes works; How to join; How we raise and then lend money to our Members; Other services we can offer to members. Radical Routes: How to set up a Housing Co-op "We believe that everyone should be in control of their own housing, not at the whim of their landlord. Co-ops also provide secure homes, so that your housing is not dependent on your financial security." Radical Routes: How to Set Up a Social Centre legal structures, business planning, property maintenance, licencing, policies, housing legislation, running a bar, etc, etc, etc. Co-operatives UK: Simply Finance guide from Co-operatives UK, an excellent guide to finance in your co-op or other social enterprise. Co-operatives UK: Simply Legal a comprehensive guide to the different options for financing a community enterprise. Co-operatives UK: Simply Startup a guide for anyone involved in the creation of an enterprise that will be owned by, run by, and supported by the community in which it operates. Co-operatives UK: From Conflict to Co-operation how to deal with conflict by improving communication, improving meetings and decision-making, managing the change caused by organisational growth and development and clarifying the role of the governing body. Co-operatives UK: Simply Governance a comprehensive guide to understanding the systems and processes concerned with the running of a sustainable community enterprise. Co-operatives UK: Worker Co-operative Code of Governance based on the seven co-operative principles this guide explains how to use these principles to both run your business and govern your co-operative successfully. Select a Structure Tool from Co-operatives UK - to help you choose a structure and legal form for your co-operative, mutual or non-profit organisation. More resources from Co-operatives UK. The Hive - a business support programme from Co-operatives UK offering a mix of online resources, training and advice for new start and existing co-ops. Running a workshop is a great way to share your skills or help people learn from each other. It can feel a bit daunting if you're new to it, but this briefing will help you put a good workshop together. Easy access to a venue is essential for a successful community event. This is a guide to practical access issues for event organisers when they're planning a meeting or choosing a venue. (For a facilitator's guide to access issues see Making Meetings Accessible). Questioning is a technique often used by facilitators during workshops, meetings or one-on-one mentoring or coaching as an alternative to presenting information and answers.This briefing discusses how you can use questioning as part of your facilitation toolkit. These are translations of our work done by other groups. Please contact us if you translate or adapt any of our work so that we can link to it. The views expressed in any linked site or third party resources are not necessarily those of Seeds for Change.